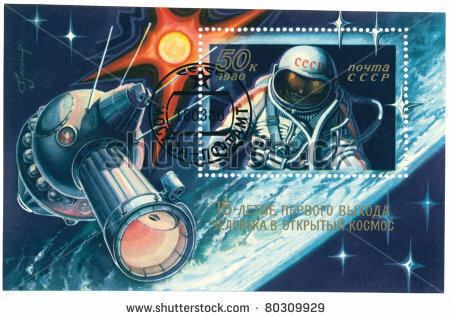 This is in response to an interesting comment on my earlier post regarding the stamp image I used, which commemorated Aleksei Leonov’s 1965 space walk (http://russianhistoryblog.org/2013/12/russian-space-history-transnational-culture-and-cosmism/#comments). The comment noted differences between the United States and the Soviet Union. Not only was the Soviet Union more concerned with celebrating space feats on stamps, but Soviet cosmonauts were themselves directly involved in the creation and promotion of those stamps. After his flight Gagarin wrote an article on the theme of cosmonauts on stamps and carried on a correspondence with avid philatelists. 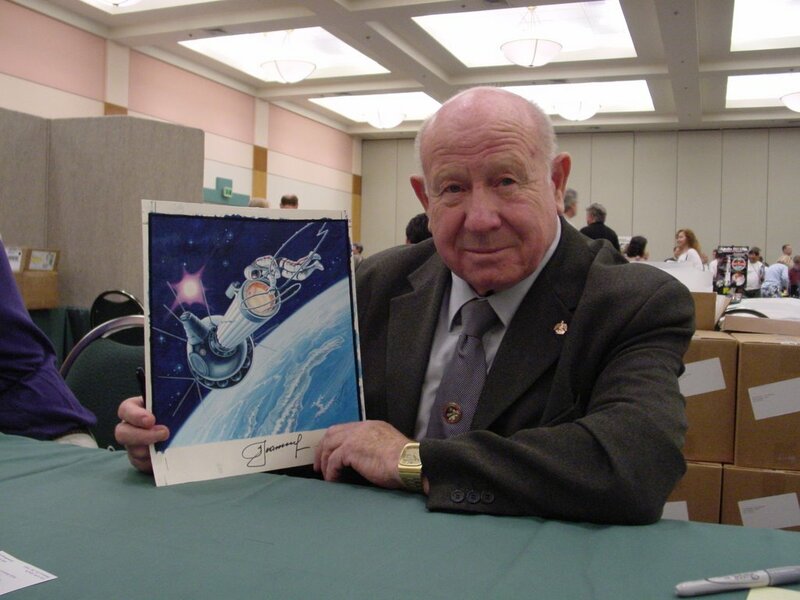 Leonov, the cosmonaut-artist, actually drew the images that appeared on many cosmonaut-themed stamps (yet another illustration of how the cosmonauts promoted themselves above and beyond official state promotion). Cosmonautics was also celebrated on coins issued for various jubilees of Soviet space accomplishments. I’m not aware, though it is far from my specialty, of the extent to which American astronauts appeared on coins, if at all. With regard to the celebration of Soviet cosmonautics in various media Cathleen Lewis at the Air and Space Museum has done quite a bit of work. Lastly, in my research at the Reagan Presidential Library and Archives, in materials dealing with NASA and international collaboration, I came across documents from NASA officials complaining about the US Postal Service’s reluctance to celebrate space feats on stamps and the absence of a space-stamp collecting culture as compared to the Soviet Union. To my mind, the relatively intense culture of cosmonaut-themed stamp collecting in the Soviet Union gets to a larger point in the general scholarship on Soviet space history — the deep engagement of a good portion of the population in the Soviet space enterprise. The point is reinforced in Roshanna’s post, which illustrates that the habit of thinking about space exploration began at a very early age in the 1950s. What concrete effect this all had on the actual space enterprise — getting back to a question raised in Asif’s original post — is hard to say, but it certainly didn’t hurt. Gagarin dreamed of going into space before he had any hope of being a spaceman, and without those dreams it seems likely he would have chosen a different career path. In other words, without a culture of dreaming about space, there would be no Gagarin, Tereshkova, Leonov, Korolev, etc. And at some level cosmonaut-themed stamps sustained that habit of thinking with head cocked high toward the heavens. This entry was posted in Russian and Soviet Art, Russian Space History, Soviet and Russian Space Flight. Bookmark the permalink. …IIRC, the only US coinage that carried any commemoration of a US space mission or event was the backside of the Eisenhower Dollar, which carried a rendition of Mike Collins’ patch design for Apollo 11. I actually had a 14k gold-plated belt buckle with one of these also plated and mounted with the Ike side out, so naturally I did the honorable thing and flip the coin over so the Eagle side was visible. …Whoops! Should have checked with Robert Pearlman over at CollectSpace first. The Shuttle program was given a bit of – no pun intended – space on the backside of the 2004 Florida State Commemorative Quarter. So that’s two examples of US coinage commemorating US space exploration, and when you consider how relatively little the backsides – much less the fronts – of US coins changed during the half-century since Sputnik as compared to other nations’ currencies, that might arguably be in the “not so bad” category. …The embarrassing surprise from re-reading this article was that I’d forgotten that the first US space commemorative stamp was -not- for Echo I as I’d recollected, but for Fort Bliss’ Centennial in 1948. A captured V-2 launch is depicted on the stamp, which so far has been the -only- stamp issued by any country with one of Von Braun’s “Vengeance Weapons” on it for any reason, including the Nazi regime under which the weapon system was developed. Go figger. eh? That makes sense — that the stability of American currency imagery explains the absence of more commemorative coins (of any sort, not just space). Soviet coinage, by comparison, was far less stable (and certainly far less valuable in terms of what it could buy). The constant changes in Soviet currency afforded many opportunities for commemorative issues, I suppose, combined with the relentless Soviet tendency to inscribe everything with political messages and content. The Ohio quarter features the Aldrin frontal view from Apollo 11 in relief along with a Wright flyer. This one was awarded in 2011 and features Glenn, Armstrong, Aldrin and Collins. Its available in a silver dollar size and a much larger 3 1/2 inch. Other mints issued medallions as commemoratives for commercial sale all through the 1960s at the height of the space program (Danbury Mint, Franklin Mint, Robbins, Medallic Art, and different issues came in base metal, pewter, copper, bronze, silver, gold and platinum. Some were done cooperatively with NASA and some were issued by NASA. Franklin Mint issued medallions containing silver carried to the moon on Apollo 13 and 14. NASA issued medals containing metal carried on Apollo 8, 11, STS-1, and other missions. There are many (I’d guess in the hundreds) of different commemorative medallions. Some feature the astronaut’s likenesses but most feature the spacecraft and events from the missions. In the US, there were other widely collected ‘commemoratives’ besides coins and stamps. These included toys and model kits, widely distributed magazines and mission patches, figures of astronauts, banks, illustrated dishes….